Are you going to design your pooja room interior? If yes, then take a look at these beautiful, divine pooja room mandir designs. They can turn any ordinary space into a soothing pooja room wherein you can your spend time praying and meditating. These pooja room mandir designs are made by highly skilled and experienced artisans of India. Most of them are hand-carved with intricate designs on them. Pooja room mandir designs are available in a wide variety of material, size and design. These pooja mandirs/mandaps can fit into tiny spaces and are perfect for small apartment and house. So, what are you waiting for, scroll down and take a look at these awesome pooja room mandir designs and pick one for your house. This is an elegant teak wood mandir for pooja room. It has a drawer where you can store pooja items. I love the criss-cross design on its back. Get this small pooja mandir for your house. This is an open teak wood mandir with skilfully carved elephants balancing the pillars. Here is a pooja shelf that you can hang it on the wall of your pooja room. It has a very sleek and has a delicate design. Go for these elegant pooja room mandir designs. This pooja cabinet is gorgeous and can be placed in anywhere in your house. A perfect pooja mandir for your living room! It is a pretty hand crafted, hand painted, wooden pooja mandir. You can pick these pooja room mandir designs with drawers and doors for your home. This is a nice pooja room design for small homes. If you are looking for a big pooja mandir, then choose this stand alone design. It has lots of space for placing idols and paintings and photograph of deities. Buy this beautiful seasoned teak wood pooja room mandap. These pooja room mandir designs have intricate carvings on it. You can go for this exquisite pooja mandir with eye-catching meenakari work on it. Meenakari work is done by skilled craftsmen who make intricate designs on the metal surface which is then filled in with colours. It’s durable and sturdy with ample of storage space. No one can miss this antique finish pooja room mandir. It looks like a miniature temple. The carving makes it more attractive and divine. Here is a pretty glass home temple with a bit of detailing on it. You can place this pooja mandir in your living room or hall. Go for this pooja ghar in glass with an OM symbol. Place it in your pooja ghar or on any shelf in your house. If you want something that’s totally different from the usual mandaps, in that case you need to take a glance at these clear glass pooja room mandir designs. This is a simple, small marble pooja mandap. Place this in your pooja room and decorate it with flowers and diyas. Here is a wonderful marble mandir with golden border and stone work on it. I love those cute little floral patterns on the pooja mandir. Brass is extensively used in pooja, so why not go for a brass pooja mandir? It has a simple structure that comprises of a base and a dome standing on four pillars. This pooja mandir is made up of premium quality plywood which is then covered with oxidized aluminium and copper. Copper is given a complete lacquered finish which prevents blackening. 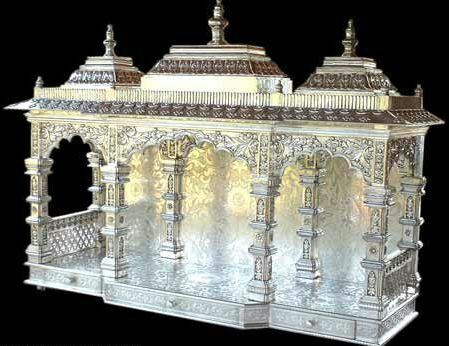 Decorate your pooja room by placing this classic silver mandir in it. It is designed like a mini temple with domes and pillars. Mount this gorgeous 24 carat gold coated wooden pooja temple on the wall. The elegance comes from the intricate carvings and gold work on it. You can hang this pretty gold coated pooja mandir shelf on the wall of your pooja room. Place idols on it or hang photos of deities on the wall. This entry was posted in Pooja Room, Pooja Room Designs and tagged Brass Home Temple, Glass Pooja Mandap, Gold Coated Pooja Mandap, How to Decorate Pooja Room, Marble Pooja Mandap, Pooja Ghar, Pooja Room, Pooja Room Decoration Ideas, Pooja Room Design for Homes, Pooja Room Design for India, Pooja Room Design Ideas, Pooja Room Designs, Pooja Room Ideas, Pooja Room Interior, Pooja Room Interior Decoration, Pooja Room Interior Design, Pooja Room Mandap, Pooja Room Mandap Designs, Pooja Room Mandir, Pooja Room Mandir Designs, Pooja Room Positioning, Silver Pooja Mandir, Wooden Pooja Mandap by Homemakeover. Bookmark the permalink. What is the price of Serial No. 7 – Oxidized Metal Pooja Room Mandir. Is is possible to despatch the same to Kolkata with different length/height/width viz. Length – 32″, Width – 16″ and Height – 36″. What will be the price of the same. I like NO 1. Wooden Pooja Room Mandir Design..
Could you specify the price and how to place order for the same..
designs r good but insufficient information to purchase. Plz. mention sizes ( width, length, height) of deoghar. And one more important thing , please mention prices. I want to buy brass pooja mandir. Model No.7 pl let me know cost and measurements also. Do you ship these to US. If so can you tell me the prince including shipping. Please send me the price for Model 4 and 9.
and also the size . Also for the model of Courtesy of Mantra Gold Coating (last one). If possible give the shop address in Bangalore. Sir what is the price, size of SL.No. 3, 4, 9.whether all those will get with our required dimension. How to purchase? What is the sale price? Please let me know. I like 3 4 & 9 design. So please contract on my mobile number. Am interested in the mantra gold wall pooja mandir… can I please have details from where I can view the product. Pl let me know how to get one if I select some design. No information is given. very nice all are. I want to buy some mamdir. pls contact me. Just click on the photo and buy them directly from the seller. We at Aarsun Woods can provide custom made Wooden temple for your home. Have a look at our website and place an order. Just click on the ‘Buy Now’ button to purchase the brass temple. Thank you for adding our Wooden Temples on your website. A Wooden Temple can be placed anywhere in your house depending upon the size and design you select. We at Aarsun Woods excel in made to order designs in wooden temples. Have a look at our website for more made to order and ready designs in Wooden temples. We would love to get a feedback from you.